Motivosity is a software system specifically developed to make the work experience more fulfilling. With this system, business owners can drive more productive results for their companies, as they ensure a pleasant and yet competitive environment for their employees to show their true potential. Thanks to Motivosity, businesses can recognize more productive workers and give them the most productive tasks. Since it is generic in nature, Motivosity is easy to configure, and will therefore meet the needs of every business environment. The company was founded in 2013, but despite of being a relatively young system, Motivosity has gained valuable acknowledgement in the industry. It has won the 2015 “Best Disruptive Technology” award, along with being UV50 To 50 Utah Winner, and got shortlisted in Red Herring Tap Tech 100 2015. 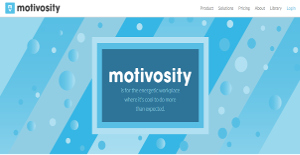 Motivosity provides both employees and managers with an easy and social way to appreciate and acknowledge each other’s efforts through a peer to peer recognition system. The employee will be notified regarding any appreciation he gets from his managers and co-workers, and win a number of motivational awards and recognition points. For the purpose, this software features a reward and gift store, where employees can spend their accumulated reward money. The store consists of approximately 200 digital gift cards. It doesn’t charge any rewards fee, and still delivers those immediately upon purchase. Alongside this unique recognition and reward system, Motivosity also compiles data across all kind of culture-reinforcement activities. These enable managers to stay focused and drive positive results. The dashboards and reports help teams make smarter decisions. It also has a unique organization chart that allows users to understand the organization hierarchy. These organization charts can be managed by syncing with your HRIS system or adjusting them in Motivosity. At the same time, it features a formal reward system for their employees. These awards can either be centralized or can managed at team level. The award owners will be prompted by the software to give away awards on regular basis. It has a milestone area, which keeps track of important dates for your team, and where users can add important dates. In addition to all these features, Motivosity also enables users to have their own personalized profiles. These profiles are not limited to their current job roles and title, but also include their interests, off-job responsibilities and personality traits. The employees having common interests can easily get connected. Last, but not least, there is a built-in personality assessment feature, which employees can use to conduct self-evaluation within two minutes. It helps in guiding effective and productive communication. If you are looking into Motivosity it can also be beneficial to check out other subcategories of cloud based gamification software available in our database of B2B software reviews. Organizations have diverse needs and requirements and no software platform can be ideal in such a scenario. It is pointless to try to find an ideal out-of-the-box software product that meets all your business requirements. The wise thing to do would be to adapt the solution for your specific requirements, staff member skill levels, finances, and other aspects. For these reasons, do not rush and subscribe to well-publicized leading systems. Though these may be widely used, they may not be the ideal fit for your particular requirements. Do your research, check out each short-listed platform in detail, read a few Motivosity reviews, speak to the vendor for explanations, and finally select the app that offers what you need. How Much Does Motivosity Cost? We realize that when you make a decision to buy Gamification Software it’s important not only to see how experts evaluate it in their reviews, but also to find out if the real people and companies that buy it are actually satisfied with the product. That’s why we’ve created our behavior-based Customer Satisfaction Algorithm™ that gathers customer reviews, comments and Motivosity reviews across a wide range of social media sites. The data is then presented in an easy to digest form showing how many people had positive and negative experience with Motivosity. With that information at hand you should be equipped to make an informed buying decision that you won’t regret. What are Motivosity pricing details? What integrations are available for Motivosity? If you need more information about Motivosity or you simply have a question let us know what you need and we’ll forward your request directly to the vendor.